All coaches, especially new coaches to the FSBL, should attend all mandatory league meetings, gain NYSCA Certification, and uphold the standard of conduct expected by the Farmwell Station Basketball League by providing a positive environment for all eligible participants. 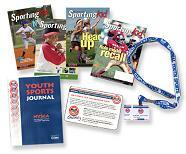 The coaches application requires a current National Youth Sports Certification Association (NYSCA) membership number. New coaches and returning coaches must visit the NYSCA Online Registration Site. The FSBL will pay the $25 training fee. The FSBL will also pay the annual renewal fee for returning coaches.